As educators and support staff, we have more than 8,000 reasons “why” to show up for work each day. Whether staff members work directly with students in the classroom or sit in an office processing payroll, they’re all in this for the same reason. To make a difference in the lives of our students. 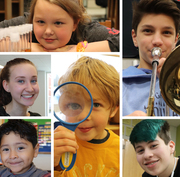 Check out Superintendent Pontrelli's column about the 8,000+ reasons why we do what we do! School board members are considering a change to school start times that would allow for high school students to begin school later in the day. Medical evidence and research suggests that a start time of 8:30 a.m. or later would better align with teens’ unique sleep needs - improving both the physical and mental health of high school students. Stillwater could also see a financial benefit from adjusting start times. Read more. The board will be sharing a proposal with the community in the coming weeks, and will hold a series of meetings prior to spring break to gather feedback. Watch for more details coming soon. Oak-Land staff tell students, "You matter"
Oak-Land Middle School students returned to school from a long weekend to find personal notes from their teachers posted in their lockers. The handwritten notes provided words of encouragement, affirmation, and celebration of the things that make each student unique. Teachers wrote a personal message on each, and signed the notes with the words, “You Matter.” See photos on Facebook. Hear what local business and community leaders believe we need to provide our students for them to be successful future citizens and leaders. Join us for a Community Leader Roundtable: Feb 12 at 6 p.m., Oak Glen Golf Club in Stillwater. This is another piece of our work to develop a Portrait of a Graduate, a document that will serve as the foundation of our next strategic plan. The Portrait will highlight the skills, attributes and experiences that you - our community - have said students need before graduating from our schools. Have ideas to share? Take this short survey now! A dozen students recently participated in the Medical Explorers program at Lakeview Hospital. Students were able to visit the birth center to see a pediatrician do a well-baby check on a newborn. They also had a chance to put on scrubs in the operating room, learn about laparoscopic surgery activity, and practice sutures. Read more. For the first time in school history, Stillwater Area High School students will compete in the State One Act Play Festival. The Section 4AA Champions will compete on Thursday, February 8 at 4 p.m.